Marco Ricci, Riunione Musicale, before 1708. 9th: 'Sous le Microscope: French Baroque music for viola da gamba'. Performed by leading early music performers, Sam Stadlen, Reiko Ichise, and Ryaan Ahmed, this programme presents music for viola da gamba by some of the most famous composers of the French Baroque along with some less well-known names whose music will both charm and surprise. Programme includes music by Marin Marais, Le Sieur de Sainte-Colombe, and Louis de Caix d’Hervelois.' Burgh House, Hampstead NW3 1LT, 2pm. Book here. of Great Britain Meeting. 4.30pm, The Dutch Church, London EC2N 2HA. More information here. 18th: ‘In Nomine’ – Fretwork offers a treasure trove of 'In Nomine' settings by 16th century composers Tavener, Tye, Parsons, Byrd, Picforth, Gibbons, Lawes and Purcell to contemporary composers Gavin Bryars and Nico Muhly. St Mary’s Church, South Creake, 7pm. More info here. 29th: Sunrise to Sunset: Fretwork are joined by the lyrical young soprano Clare Wilkinson, adding poetic songs and lieder on the passing of the day by Henry Purcell, Vaughan Williams and Hugo Wolf. Dartington Great Hall, 7.45pm. 21st: The State of the Art: Music for violin, gamba, and harpsichord from the French and Stylus Fantasticus schools of the 17th and 18th centuries. Hexham Abbey Great Hall, 7.30pm. 21st: Ryedale Festival: Soli Deo Gloria 1 - Fretwork bring the sonorities of a viol consort to the music of Bach, including the great Passacaglia, and interleaved with the music, poems by Emily Dickinson and Gerard Manley Hopkins about faith, doubt and the beauty of the natural world. All Saints Chapel, Hovingham, 11am. 19th: Ryedale Festival: Fretwork are joined by the singer Clare Wilkinson to perform music from over 500 years, from Elizabethan England to the present day. Castle Howard Chapel, 7pm. 18th: Ryedale Festival: Fretwork & Choir of King's College, Cambridge perform English verse anthems. Ampleforth Abbey, YO62 4ER, 8pm. 15th: Viola d'amore Gems from the Rostock LibraryMusic for Flute, Viola d'amore & Continuo. St. Bartholomew's Church, Sydenham SE26 6QR, 5pm. 14th: Above the Stars: The Genius of the English Verse Anthem. Chelys perform English consort anthems with the Renaissance Singers at St. Gabriel's, Pimlico, Warwick Square, Pimlico, London, SW1V 2AD, 7.30pm. Details here. 3rd: Unaccompanied recital at St Bride's, Fleet Street, 1.15pm. 19th: 'In Nomine' with Fretwork. ​Arizona Early Music Society - Grace St. Paul’s Episcopal Church, 2331 E. Adams St., Tucson, Arizona, 3pm. 15th: 'In Nomine' with Fretwork. Walt Disney Concert Hall, Los Angeles, CA. 4th: 'Phantasticus' - a programme of music for solo violin, solo gamba, and the three combined with music by Buxtehude, Biber, J.S. Bach, Marais, and Leclair. With Magdalena Loth-Hill and John Green. Hexham Abbey, 7.30pm. 20th: Buxtehude's Membra Jesu Nostri with Fretwork and The Sixteen. Wigmore Hall, London. 7.30pm. 24th: 'The Sorrows of John Dowland' - The Lachrimae pavans of John Dowland with works by Anthony Holborne, John Danyel, and Robert Jones who each ‘borrowed’ Dowland’s theme. With Chelys and Dame Emma Kirkby. St Mary’s Church, Warwick, CV34 4AR, 7.30pm. 17th: Private concert with Fretwork. 12th: 'In Nomine' with Fretwork. Great Hall, Durham Castle, Palace Green, Durham, 8pm. 11th: Choral Evensong with Fretwork at Durham Cathedral. 4th: 'Music with Her Silver Sound' - Chelys with actress Sarah Finch. Music from the time of Shakespeare, with readings from his plays and sonnets. A one-hour concert followed by refreshments. St John's URC, Hallowell Rd, Northwood, Middlesex HA6 1DN, 3pm. 3th: 'Music with Her Silver Sound' - Chelys with actress Sarah Finch. Music from the time of Shakespeare, with readings from his plays and sonnets, St Mary Woolnoth, King William St, London EC3V 9AN, 7.30pm. 26th: 'Ayres and Graces' - a concert of Suites and divisions by Christopher Simpson with consort music by Jenkins, Lawes, and Purcell. Passkerk, Baarn, Netherlands, 8pm. 23rd: The World Encompassed with Fretwork. Keele University, 7.30pm. 15th: English sacred music: the consort verse anthems of Orlando Gibbons with Fretwork, His Majestys Sagbutts & Cornetts, and the Magdalena Consort. Royal College of Music, 7.30pm. 12th: The Tempest, Taliesin, Swansea University, Singleton Park, SWANSEA, SA2 8PZ, 7.30pm. 11th: The Tempest, Capstone Theatre, Hope University, 17 Shaw St, LIVERPOOL, L6 1HP, 7.30pm. 10th: The Tempest, RWCMD, Castle Grounds, Cathays Park, CARDIFF, CF10 3ER, 7.30pm. 6th: Bach's Art of Fugue with Fretwork. Brighton Early Music Festival, Ralli Hall, BN3 3TH, 2.30pm. 2nd: 'Divine Madness: The Vision of Albion' - A new work by Graham Treacher setting William Blake, with Charles Daniels and Fretwork. Kings Place, Kings Cross, London N1, UK, 7.30pm. 24th: FRETWORK TOUR 'The Cries' - Cries by Gibbons, Ravenscroft, and Cobbold with Fretwork and the St Christopher Singers. Alix Goolden Hall, 907 Pandora Avenue, Victoria, BC. Canada. V8V 3P4​. 7.30pm. 23rd: FRETWORK TOUR Choral Evensong, Chapel of the New Jerusalem, Christ Church Cathedral, Victoria, BC, 5pm. 22nd: FRETWORK TOUR 'In Nomine' - Music by Byrd, Gibbons, Purcell, Gavin Bryars, Nico Muhly, Fretwork. Chapel of the New Jerusalem, Christ Church Cathedral, Victoria, BC, 7.30pm. 21st: FRETWORK TOUR 'In Nomine' - Music by Byrd, Gibbons, Purcell, Gavin Bryars, Nico Muhly, Fretwork. Christ Church Cathedral, 690 Burrard St, Vancouver, BC V6C 2L1, Canada, 7.30pm. 19th: FRETWORK TOUR 'In Nomine' - Music by Byrd, Gibbons, Purcell, Gavin Bryars, Nico Muhly, Fretwork. Luis Ángel Arango Concert Hall, Cl. 11 #4-14, Bogotá, Cundinamarca, Colombia, 7.30pm. 16th: FRETWORK TOUR 'In Nomine' - Music by Byrd, Gibbons, Purcell, Gavin Bryars, Nico Muhly, Fretwork. First United Methodist Church 1411 Broadway Lubbock, Texas, 7.30pm. 15th: FRETWORK TOUR 'In Nomine' - Music by Byrd, Gibbons, Purcell, Gavin Bryars, Nico Muhly, Fretwork. St. Cecilia Music Series, First Presbyterian Church 8001 Mesa Drive Austin, Texas, 7.30pm. 14th: FRETWORK TOUR 'In Nomine' - Music by Byrd, Gibbons, Purcell, Gavin Bryars, Nico Muhly, Fretwork. Mississippi Academy of Ancient Music, St. James' Episcopal Church, 3921 Oakridge Dr, Jackson, MS 39216, USA, 7.30pm. 13th: FRETWORK TOUR 'In Nomine' - Music by Byrd, Gibbons, Purcell, Gavin Bryars, Nico Muhly, Fretwork. Brendle Recital Hall, Wake Forest University, North Carolina, 7.30pm. 11th: FRETWORK TOUR 'In Nomine' - Music by Byrd, Gibbons, Purcell, Maja Solveig, Nico Muhly, Fretwork. Cleveland Museum of Art, Cleveland, OH, 7.30pm. 9th: FRETWORK TOUR Evensong at Holy Trinity Lutheran Church, Manhattan, NY. With Fretwork. 5pm. 8th: FRETWORK TOUR 'In Nomine' - Music by Byrd, Gibbons, Purcell, Gavin Bryars, Nico Muhly, Fretwork. UWM Zelazo Center (2419 E Kenwood Blvd), Milwaukee, US. 7.30pm. 7th: FRETWORK TOUR 'My Mind to Me a Kingdom is' - Music by Byrd, Gibbons, Purcell, Gavin Bryars, Nico Muhly, Fretwork with Susie LeBlanc. First Church in Cambridge, Congregational, Boston, US. 7.30pm. 6th: FRETWORK TOUR 'My Mind to Me a Kingdom is' - Music by Byrd, Gibbons, Purcell, Gavin Bryars, Nico Muhly, Fretwork with Susie LeBlanc. Salle Bourgie, Montreal, Canada, 7.30pm. 2nd: Private concert of music by Dowland and his contemporaries with Sestina Consort of Viols. 24th: Buxtehude Membra Jesu Nostri with Chelys and Cambridge Baroque. St Edward’s Church, Cambridge, 7.30pm. 25th: Bach's Art of Fugue and Purcell's Fantasias with Fretwork. Innsbrucker Festwochen der Alten Musik, Jesuitenkirche, Innsbruck, Austria, 20:00. 23rd: Bach's Art of Fugue and Purcell's Fantasias with Fretwork. Posznan, Poland. 15th: BBC Lunchtime Prom with Fretwork and Stile Antico. Cadogan Hall, 13:00. 9th: The Goldberg Variations with Fretwork, Peñiscola, Castell del Papa Luna, 22.30. 8th: The Goldberg Variations with Fretwork, Jaca, iglesia del Carmen de Jaca, Spain. 31st: Performance of 'In Nomine' programme with Fretwork, at ​Darlington international Music School. 10th: The World Encompassed with Fretwork. Cheltenham Music Festival, Pittville Pump Room, 11am. 9th: The World Encompassed with Fretwork. Harrogate Internaltional Festival, St Wilfrid's Church, 8pm. 8th: The Tempest at the York Eearly Music Festival. National Centre for Early Music, York. 10pm. 2nd: Music for Voices and Viols with the 70 Chamber Choir with Chelys. St Mary's Church, High Street, Minster, 7pm. 1st: A Feast of Baroque Concertos - with Follia and the Stanesby Players. St Michael's church, SW1W 9EF, 7.30pm. 25th: 'With a merrie noise' - Verse Anthems, anthems & consorts for viols by Orlando Gibbons, Thomas Tomkins & William Byrd, with Fretwork. Stour music festival, 7.30pm. ​24th: Fretwork 30th Anniversary concert. Kings Place, 7.30pm. 22nd: Appearing on BBC R3 In Tune with Fretwork. 4.30pm. 19th: Baroque cello recital with Ibi Aziz and James Akers. Plumstead, The Ascension Church, SE18 2SG, 4pm. ​14th: The World Encompassed with Fretwork. Royal Northern College of music, 7.30pm. 11th: The World Encompassed with Fretwork. Alwinton festival, 8pm. 8th: The World Encompassed with Fretwork. Salisbury festival, St Thomas's Church, 7.30pm. 28th: 'Music with Her Silver Sound' - Consorts from the time of Shakespeare with readings by actress Sarah Finch. Old Baptist Chapel, off Church Street, Tewkesbury GL205RZ, 3pm. 27th: Concert of newly discovered music by Handel and Telemann for the gamba. With the Stanesby Players, St George's Hanover Square, London, 7pm. 26th: 'The Art of Fugue' with Fretwork. Kettle's Yard, Castle Street, Cambridge. 8pm. 17th: Fathers and Sons: A musical inheritance. Viola da gamba recital with John Green, harpsichord. Programme includes Marais suite in A minor (Livre III), JS Bach gamba sonata in G major, CPE Bach gamba sonata in C majoy, Abel adagio. Carlisle Cathedral, 12:45pm. 15th: Fathers and Sons: A musical inheritance. Viola da gamba recital with John Green, harpsichord. Programme includes Marais suite in A minor (Livre III), JS Bach gamba sonata in G major, CPE Bach gamba sonata in C majoy, Abel adagio, DeMachy suite in G major. Warden, St Michael's Church, 17:30. 10th: 'The Masque of Augurs' - reconstructed masque by Ben Johnson. Invitation only. 7th: 'The Tempest' -- music exploring new and historical musical settings of Shakespeare's play. Holyhead Ulchedre Centre, 7.30pm. 22nd: 'In Tune' live broadcast with Chelys on BBC Radio 3 at 4pm. 26th: 'The World Encompassed' with Fretwork and narrated by Samuel West. ​25th: St John Passion in Maldon, St Mary's Church with Pegasus Baroque Orchestra (gamba continuo), 7pm. ​10th: 'All the King's Men' with Chelys: Music for viol consort by English composers in the Stuart Court from James 1 to Charles 11. Poole Centre for the Arts, 1pm. 28th: Lachrimae - with Chelys and Emma Kirkby. An hour's concert of Dowland's Lachrimae pavans, and sorrowful songs.Crown Court Church of Scotland, Russell Street, London WC2B 5EZ, 4:00pm. 27th: Tudor and Jacobean Music with Chelys and the Amici Chamber Choir. Pinner Parish Church, Middlesex, 7:30pm. 19th: Martin Peerson’s: Grave Chamber Music with Fretwork and I Fagiolini. Martin Peerson’s ground-breaking work from 1630 for 5 voices and 5 viols with organ sets a poetic sequence by Fulke Greville. Leeds University, 7:30pm. 17th: Evensong at St Bartholomew's Church with Fretwork. To be broadcast on BBC radio 3. 12th: 'Passacaille' with Fretwork. Programme to include music by Bach, Handel, Legrenzi, Purcell, Charpentier & Jean-Baptiste Antoine Forqueray. King's Place, London, 7:30pm. 30th: 'Music of the Stuart Age', with Chelys and the King Charles Singers. 5-part consort music by William Lawes and others. Part of the King Charles festival at King Charles the Martyr Church, Tunbridge Wells, 7:30pm. 24th: Bach's 'The Art of Fugue' with Fretwork. Balliol College Hall, Oxford. 8:30pm. 17th: A concert of Jenkins's 4-part fantasias and Bach's Art of Fugue with Fretwork. Sherborne's St Mary Magdalen church, 7:30pm. 14th: Invitation-only recital of Jenkins's 4-part fantasias with Fretwork. Brixton. 9th: 'Evening in the Palace of Reason', with La Follia. The Baroque quartet Follia perform music from the court of Frederick the Great, including JS Bach's trio from the Musical Offering, Gamba sonata in C by his son CPE Bach and a little music by Frederick the Great himself. St John's Church, Spencer Hill, Wimbledon, Middlesex SW19 4NZ. 7:30pm. 22nd: Private Christmas concert in Farmington with Fretwork. Music including Jenkins, Holborne, and arrangements from Bach's Orgelbüchlein. 18th: 'Taverner & Tavener' with Fretwork, Lestyn Davies, and Nicholas Daniel. King's Place, 7:30pm. 15th: (Baroque cello) 'A Baroque Christmas' The Lovekyn Consort performs music from around 18th.-century Europe, with carols for audience participation. The Lovekyn Chapel, Kingston Grammar School, KT2 6PY. 7:30pm. 4th: 'The Cries of London' - music by Gibbons, Deering, Cobbold, and Ravenscroft. Fretwork with Red Byrd, Shoreditch Church (St Leonard's), 7:30pm. 15th: Evensong at Hampton Court, Chapel Royal with Fretwork, 3:30pm. 12th: Music by Hume, Gibbons, Lawes & Purcell at LSO St Luke's with Fretwork (BBC Radio 3 Lunchtime Concert), 1:00-2:00pm. 2nd: Concert of charming early English Baroque works by Lawes and Jenkins with Fretwork at the International Festival of Viols, Royal College of Music, London, 6pm. 1st: A concert of Dowland with Chelys, St John's Church, Hallowell Road,Northwood, Middlesex HA6 1DN. 11th: Evensong at Hampton Court, Chapel Royal with Fretwork, 3:30pm. 25th: Private wedding quartet performance. 24th: Live recording of music by Marais and Forqueray with Liam Byrne to privately invited audience. Victoria and Albert Museum, 7pm. -28th: A concert of Bach cantatas: BWV 106 Actus Tragicus, BWV 170 Vergnügte Ruh, and BWV 51 Jauchzet Gott. All Saints Alton Priors, Marlborough, 4pm. -27th: Concerti by Bach, Telemann, and Marcello, as well as Couperin's Douzieme Concert pour deux violes, and music by Blow and Purcell. All Saints Alton Priors, Marlborough, 7pm. - 24th: 'Aspects of Love' with Ceruleo at the St Jude's Proms - Music by Purcell and Monteverdi. St Jude's Church, Central Square, London, 12:45pm. - 6th: 'Tea-lemann Party' (cello continuo) - Concerti by Telemann, Sammartini and Stanley, with the premiere of Alleluia & Organum by Charlie Barber. St Michael's Church, Chester Square, London, SW1W 9EF, 3pm. -15th: Concert of new music at the Vale of Glamorgan with Fretwork. Programme to include Orlando Gough, Nico Muhly, Barry Guy, and Arvo Pärt. St Augustine’s Church, Penarth, 7.30pm. - 9th: Brandenburg 6 (gamba 1) with Compagnia d'Istrumenti at the National Centre for Early Music, York. 12:30pm. -4th: A concert of Lawes, Je mins, Simpson, Purcell, Couperin, and others with Ibi Aziz, John Marston, and Diane Moore. The Coach House, The Elms, Bishops Tawton Barnstaple EX32 0EJ Sunday 3rd May 2015 at 5.30 p.m.
- 25th: Knock'd on the Head Abroad - A varied programme of Post Civil War music by Locke,Tomkins,Derosier,Keller,Parcham. With the Stanesby Players. Camden URC, Buck Street, London, NW1 8NJ, Saturday 25th April, 8.00pm. -5th: Evensong at Hampton Court Chapel Royal with Fretwork. -31st & 1st: Couperin's Leçons de Ténèbres with John Green, Emily Owen, and Charlotte La Thrope. Concert to include solos for bass viol (Sainte-Colombe le fils, Fantaisie en Rondeau and Couperin's Pompe Funèbre). Church of St John of Beverley and St John Lee, 7.30pm. -21st: (Cello continuo & Gamba obligato) St John Passion in Southport, St John's Church, 7.30. -14th: (Gamba obligato) Performance of St John Passion in Durham with David Stancliffe. 7.30. -11th: (gamba continuo) Couperin's Leçons with L'Académie du Roi Soleil. Oxford, New College, 8.30pm. -3rd: Recording CD of English Civil War-era music with Chelys and the Ebor Singers. - 1st: Fretwork workshop and pre-evensong concert at Eton School. -28th: Continuo cello in Dido and Aeneas in Hexham Abbey, 7pm. -5th: Fretwork: In Nomine - Minimalism Unwrapped. Concert with Fretwork at King's Place, London, 7.30pm. Programme to include music by Bach, Parsons, Ferrabosco II as well as modern works by Michael Nyman, Gavin Bryars, and a newly commissioned work by Nico Muhly. - 29th: Ceremony of the winding of the 1689 Thomas Campion Clock. Music by Purcell and Jenkins. With Alison Crum, Roy Marks, and Ibi Aziz. Private function. -24th: Concert of consort music by Purcell, Simpson, and Locke with Chelys. Fitzwilliam College, Cambridge, 7.30pm. -21st: 'Duetto' - A short concert of music for two viols with Ibi Aziz. Duets by Schenck, Schaffrath, solos by Sainte-Colombe le Père and Marais, and the world premier of Michelangelo Ground, a piece for two viols by Charlie Barber. 11 Mandeville Place, London, W1U 3 AJ, 6pm. - 6th: Viol continuo in performance of Charpentier's Messe de Minuit with Nicholas Spice and Highbury Chamber Choir. St Thomas the Apostle Church, London, Finsbury Park, 7.30pm. - 3rd: Performance/workshop of student compositions at the Royal College of Music, London with Fretwork. -Sunday 30th: An Elizabethan Christmas concert with Fretwork and Ex Cathedra at Milton Court, Guildhall School of Music & Drama, Silk Street, London, 7.30pm. - Saturday 29th: (bass viol) Performance with Luton Choral society with Musical Compass at Dunstable Priory Church, 7:30pm. Victoria's Requiem (1605), Bach's Cantata 106 'Gottes Zeit ist die allerbeste Zeit' (Actus Tragicus), and a selection of chamber music and music for two viols. - Monday 17th: Playing minuets on the viol at Zion House with Andrew Passmore, Ian Hoggart, and Nonsuch Dance for BBC 4 show 'Dancing Cheek to Cheek: An intimate history of Dance' episode 1. Airs at 9pm, BBC 4. Featuring Lucy Worsely and Len Goodman: http://www.bbc.co.uk/mediacentre/proginfo/2014/46/cheek-to-cheek. - Sunday 26th: Private house concert: music for two viols with Ibi Aziz. Programme to include Concerts a deux violes egales by Sainte-Colombe, Sonatas from Le Nymphe di Rheno by Schenck, and Divisions for two viols by Simpson. - 20th: Baroque cello continuo for a concert at the British Museum (private function). Music to include Telemann's Musique de Table in G major, selected movements from Bach's Orchestral suite no. 2, and Abel's Quartet in F.
- Monday 24th: Lecture recital with Fretwork at the Royal College of Music showcasing modern compositions for the viol. - Saturday 20th: (tenor viol) Performance of Dido and Aeneas with Chelys, Saint John's United Reformed Church, Northwood, 7.30pm. - Saturday 6th: (tenor viol) 'In Sweet Repose: Consort songs and airs from Byrd to Purcell' with Sestina Consort and Emily Atkinson, Soprano. St John's Church, Spencer Hill, Wimbledon, SW19 4NZ, 7.30pm. - Wednesday 30th: (cello continuo) Bach's double harpsichord concerti in C major and C minor, Peterborough Cathedral at 7.30pm. With Dan Tidhar and Philip Knight, harpsichords. - Friday 25th: (gamba continuo) French Baroque chamber music featuring Rameau's Troisième pièce de Claveçin and Orphée, Marais' Pièces en Trio. Snape, details TBC. - Saturday 5th: (bass viol) Concert with Highbury Choral Society of Bach's Actus Tragicus, Monteverdi's Dixit Dominus, and Purcell's 'My heart is inditing'. St Thomas the Apostoe Church, London, 7.30 pm. - Sunday 29th: Concert of music for two viols featuring Schenck, Marais, & Forqueray. Cown Court Church of Scotland, Russell Street, Covent Garden, with Ibrahim Aziz, Mie Itoh, and Jamie Akers, 4pm. - Thursday 26th: (viol continuo) Concert of French pièces de viole. Sherborne, with Richard Boothby and Lucy Robinson. - Thursday 26th: Lunchtime concert given by the University of York Consort of viols. Programme tbc.1.00pm, Sir Jack Lyons Concert Hall, University of York. - Saturday 21st: (cello continuo) Performance of Purcell's Fairy Queen with Eboracum Baroque, York. - Sunday 15th: (Gamba obbligato) A concert recreating the Bach/Abel concerts featuring arias, symphonies and concertos by J.C. Bach, Abel, Carl Stamitz and the young Mozart, who was part of the Bach-Abel circle when in London with his family in 1764-5. 3pm, St Pauls, University of Huddersfield. Leeds Baroque Orchestra. - Friday 16th: Melancholic Dowland - featuring Dowland songs and pieces for solo viol by Cpt. Tobias Hume ('Death', 'Life', 'Harke, Harke', and 'A Souldier's Resolution'. With Poeticall Musicke. Barley Hall, 2 Coffee Yard, York, 7.30pm. - Preparing a series of concerts of French Baroque song with L'Académie du Roi Soleil. 25th May, Cambridge, 27th May, Oxford. Details tbc. - Fri 18th: Bach Johannespassion (viol obbligato), 7.30pm, St Mary's, Church Street, Maldon, Essex. - Sat 12th: Bach Matthäuspassion (cello continuo and obbligato viol). 7.30pm, Blackburn Cathedral. 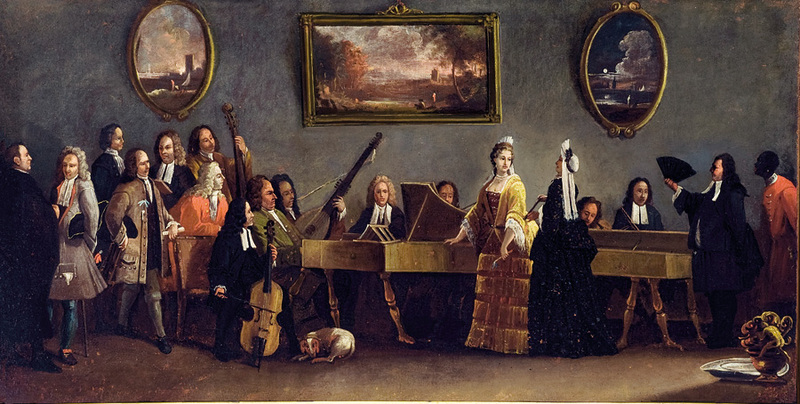 18th-century concert orchestra. - Fri 6th: Concert of war-themed late 16th/early 17thC music with The Chansonniers, Christ Church, Gt Ayton, N. Yorks. - Sat 15th: Mozart Requiem, Mass Kv258, Exsultate Jubilate. 7.30pm, The Sage, Gateshead. Newcastle Baroque. June 15th: Treble viol in performance of new work, Sadoc Sacerdos by Michael Mullen with Chelys Consort of Viols at St Peter’s Church, Vauxhall, London. April 6th: Solo viol recital ‘The Poetic Viol’ at St Michael and All Angels Church, Warden with John Green and Deborah Thorne. Repertoire included Marais Suite in A minor (Livre III), Les Voix humaines, and Tombeau pour Mr. de Ste. Colombe; Caix d’Hervelois Premier Suite (Livre III), Abel’s gamba solo composed for the Lady Pembroke, and Bach’s Gamba sonata in D.
March 3rd: Treble viol in service-performance of music by Byrd, White, and Gibbons (including Gibbons’s ‘Second Service’ and ‘O sing unto the Lord’) at Peterborough Cathedral. April 3rd: Gamba continuo in a reconstruction Tenebrae Service featuring a performance of Couperin’s three Leçons de Ténèbres in Corbridge, Northumberland. With Andrew Passmore, Nia Rhein, and Louisa Dobson. Nov. 11th: Performed extracts from Couperin’s Pièces de Viole in a lecture recital with Lucy Robinson at the International Festival of Viols, Royal College of Music. July 9th: Cello and gamba continuo in a concert of Bach’s Brandenburg Concerti for the 16th Music for Awhile Summer Festival at All Saints, Alton Priors. With Margaret Faultless and members of the European Union Baroque Orchestra. June 25th: Cello continuo and gamba obligato in a one-to-a-part performance of Bach’s St Matthew Passion, Sidney Sussex Chapel, Cambridge. With Margaret Faultless, Nicholas Mulroy, and members of the Cambridge University Collegium Musicum. May 22nd: Cello and gamba continuo in a concert of Bach’s Brandenburg Concerti 3, 4, and 6 at Girton and Sidney Sussex Colleges, Cambridge. With Margaret Faultless and the Cambridge University Collegium Musicum. May 21st: Cello continuo in a concert of Bach Cantatas in St John’s College Chapel. With Margaret Faultless, Andrew Skidmore, and members of the Orchestra of the Age of Enlightenment. Nov. 23rd: Performed solo viol music including early viola bastarda pieces, Ortiz, Marais, Schenck, and Abel in a lecture recital with Lucy Robinson at the International Festival of Viols, Royal College of Music. March 14th: Solo and continuo cello and viol in a performance with Plura Videte, Selby Town Hall. Repertoire included cello sonatas by Jean Barrière, Suites for the viol by Louis de Caix d’Hervelois and Joseph Bodin de Boismortier. Dec. 12th: Continuo cello in performance of Bach’s Christmas Oratorio in Beverly Minster with Crispian Steele-Perkins, Beverley Minster Choir, and members of the Orchestra of the Age of Enlightenment. Nov. 13th: Gamba basso continuo for Alison Crum, Ibrahim Aziz and Roy Marks in a recital of Forqueray at the Early Music Exhibition in Greenwich, London. April 11th: Gamba continuo in the first performance of French-Belgian opera Daphnis since the 1720s. Recording shown at Georgetown University, Washington D.C., on Saturday 4 April 2009 and at Harvard University, Massachusetts, on Saturday 28 March 2009. Broadcast on Lyric FM (Ireland) on 11 April 2009.